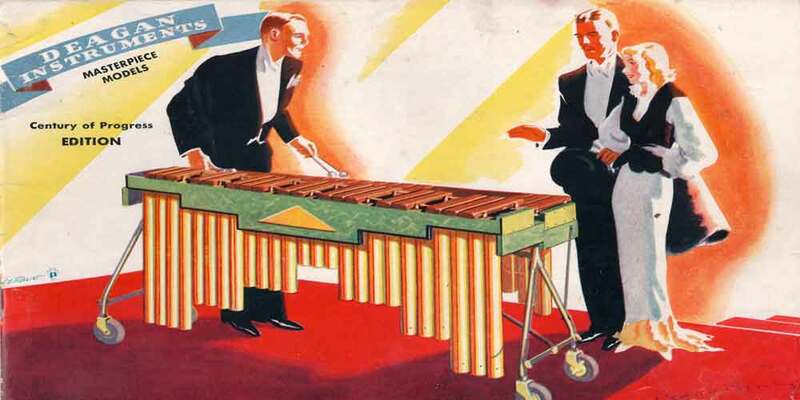 In doing a bit of research in the Deagan Century of Progress marimba, I came across this fantastic photo, which I imagine came from a brochure in 1933 or 1934. This is the 4.5 octave model (C to F) – Deagan made 25 of these for Musser’s 1933 Century of Progress marimba orchestra. I love everything about this ad. The well-dressed couple ascends the red stair case, where they are greeted by a dashing young man in tails. I wonder what he’s gong to serenade them with – a little ragtime? A transcription of something from the classical period? Sadly, my own Century of Progress marimba isn’t nearly so shiny these days. The brass resonators are tarnished and dull, and the green crosspiece has yellowed with age. Of course, I’m not dashing or young, and I don’t wear a tux when I play it, so I guess we’re even. Enjoyed you World’s Fair marimba postings. Clarence Lochner’s 3.5 is in very good condition and may need a new home at some point in time. It was bought from Mr. Lochner, along with an incredible orchestra gong in the 70’s. Could you remove my last name from the last post please?